Where is Robert Altman when we need him? The story of The Hunger Games is ripe for irony and edgy satire, but director Gary Ross plays it straight, as indeed the book is written. What we have here is Survivor meets The Bachelorette, packaged for easy consumption. It was directed by Gary Ross (who, by the way, will not be doing the sequel) and written by Ross, Billy Ray and Suzanne Collins, who wrote the very popular young-adult book. The story frames a dystopian future in which rebellion has been quelled in North America (perhaps the U.S.) and as a result is under a dictatorship. The land is divided into twelve districts. The Hunger Games are held each year when two teens, a boy and a girl, are chosen by lottery in each district to fight to the death until only one remains. All are to be watched on TV (a la The Truman Show) and when things get dull the producers can introduce some exciting elements like a forest fire or a pack of wild animals. Everyone watches and roots for their own district boy or girl. Perhaps we’re reaching a new era of unabashed female heroes. Our hero, Katniss Everdeen (Jennifer Lawrence, Winter’s Bone ) volunteers to go in the place of her sister Primrose (Willow Shields). 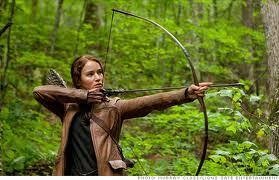 From the poorest district, Katniss is an experienced hunter. Her bravery and compassion are evident from the first. I wished her to be fierce like Lisbeth Salander (The Girl with the Dragon-Tattoo ) but without the brutality. She is instead smart and cagey and motivated to stay alive even as she wishes not to murder all the others. A lack of cleavage is to be praised; all of the girls get to dress normally as one might dress for brutal combat and severe exposure in the outdoors. You know, everyday outfits. Katniss is paired with Peeta (Josh Hutcherson, The Kids are Alright) from the district and encouraged to curry favor from viewers by pretending to be in love with him, as he apparently is with her. He is weak though and anticipates failure. 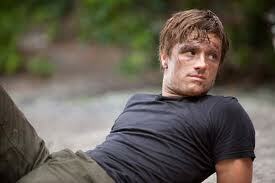 Katniss and Peeta are supplied with a kind of chaperone M.C. (Elizabeth Banks), trainer Haymitch Abernathy (Woody Harrelson) and a stylist (Lenny Kravitz). The contestants are prettied up and paraded before the crowds and to the TV audience. President Snow (Donald Sutherland) introduces the games and makes behind-the-scenes maneuvers. The people watching in the capital are grotesque by today’s standards, resembling the French excesses of the 18th Century, with gaudy clothes and excessive make-up. But even as we are invited to see them as ghoulish, we watch the games along with them and also root for our favorites, conveniently the few that we get to know. The “others” are horrible teens who band together to kill prey. We barely see them except as Katniss’s potential assassins. We just want Katniss and Peeta and a small lovely Black girl, Rue (Amandla Stenberg) to stay alive. Perhaps the best (only?) element of irony is introduced with the character of Caesar Flickerman, brilliantly played by Stanley Tucci in a Bert Parks-like role, interviewing the contestants with inane questions meant to amuse. He asks Peeta playfully if he means to win for the girl he loves back home, but is forced into a quiet “bad luck then” when Peeta reveals that the girl he loves is also in the games. At the end of the day the movie is interesting but tame, suspenseful but long. Special effects are terrific and the dialogue isn’t stupid. Katniss is brave and her stoicism makes her a very interesting female character. The acting is superior, with Lawrence and Tucci the standouts. Too bad the movie fails to make the point that the story is painfully parallel to our contemporary fascination with extreme sensationalism superficially framed as reality. We already enjoy seeing people suffer, attack each other hysterically and pretend to fall in love. I expected a cautionary tale, a bit like Lord of the Flies. Perhaps that kind of take would have been boring since today we know full well what kids are capable of. 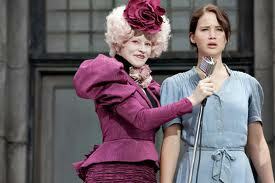 In The Hunger Game we have to settle for a competent young woman, no small feat. But there could have been so much more.